What can I feed them? How can I get the Bluebirds to accept mealworms from me? What kind of feeder should I use? My Bluebirds won’t go into the feeder I bought for them. What is wrong? Is there a less expensive way of obtaining mealworms? Can I feed them anything else? Do I have to feed the Bluebirds if I put up a nestbox? What do Bluebirds eat? Bluebirds eat many insects including crickets and grasshoppers, and insect larvae.They should NOT eat earthworms because they can’t digest them properly. Although they have been known to eat them when insects are in short supply, they can make the birds very sick. They also eat a variety of native berries such as Eastern Red Cedar; Flowering, Pagoda and Kousa Dogwoods; Red Mulberry; and American Holly. They may also learn to eat mealworms and peanut butter suet. All are similar in price, including shipping. When ordering online be sure to order at least 5 days in advance of when you will need them. How can I get the Bluebirds to accept mealworms from me?If you put the mealworms where the Bluebirds will see them, they will almost certainly accept them. You can start by putting them in a small shallow dish (with sides to keep the worms from crawling out and preferably clear glass – both for weight and to allow the birds to see the worms) and placing them near the nestbox location, or somewhere close to the perch (a fence or fencepost, perhaps) that you have seen them hunting from. If you are keeping your mealworms in the refrigerator, let them warm up before offering them for the first few times – the worms’ movement will be likely to attract the Bluebirds’ attention. Then you can slowly move the feeding dish a little further away so as not to attract other birds too close to the nestbox. Eventually you will probably want to place the mealworms in a dedicated Bluebird feeder. What kind of feeder should I use? There are many birds that enjoy eating the mealworms you offer to the Bluebirds, and if you don’t want to go to the expense of feeding them to all the birds in your yard, you will need a feeder that allows the Bluebirds easy access but discourages or prevents larger birds such as starlings and mockingbirds from gaining access. There are several types of feeders, but the idea behind most of them is providing a small opening that the Bluebirds will have no trouble navigating, but that the other birds will find either too small or uninviting. 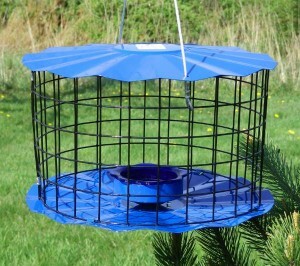 Our sister shopping site, TMB Studios, offers a number of Bluebird feeders. Our favorite is our own design, now made by Erva Tool, the BBF1. You can also find other styles online, or in your local bird supply store. You can find plans for making your own feeder . My Bluebirds won’t go into the feeder I bought for them. What is wrong? Sometimes it takes the Bluebirds a little while to understand how to use the feeder. If you’ve been feeding them from a dish, try putting the dish on top of the feeder at first. The birds will recognize the dish, and go to it. If you’re using the type with plexiglass sides, they may try to go in through the clear sides rather than through the holes at the ends. Once inside, they may have some difficulty figuring out how to get back out of the feeder, and try flying back out through the plexiglass. The specially-designed Bluebird Nut Mealworm Feeder depicted above circumvents all these problems, as its open design does not make the Bluebirds feel trapped. Some people have tried whistling or calling or ringing a bell every time they place mealworms in the feeder, and have been able to train the birds to come to the feeder when they hear that sound. Others discourage this practice, as they feel it may serve as a “dinner bell” for hawks or other predators. Mealworms (Tenebrio molitor) are the larval stage of the darkling beetle. Although nowhere as beautiful, if paralleled to a butterfly, the mealworm is the ‘caterpillar’, the pupae is the ‘chrysalis’, and the beetle is the ‘butterfly’. The fourth stage of the darkling beetle (as is a butterfly’s) life is eggs. Aside from that, they are an easy to raise source of nutritious food for virtually all insect-eating birds and reptiles. Being completely candid, the advantages of raising mealworms are the cost savings v. buying them and the ease of raising them. Just about anything else is a disadvantage. Raising mealworms is time consuming, dusty, sometimes smelly, and subject to mite and moth infestations. Raising mealworms is never recommended if anyone in the home has any respiratory problems or allergies. If you are undaunted by that candor, let’s go raise worms! Plastic bins: just about any large size and kind will do. One that works extremely well are the plastic, 3-drawer carts with castors. Each drawer is approximately 20″ long x 15″ wide x 7″ deep. Even if one isn’t going to launch 3 bins, the other drawers are great for storing other supplies (except the food medium) that are used. Moisture/ “drink of water”: for example, apple, carrot, lettuce, potato, etc. Pretty much your own experimentation. We’ve had great results with apple, cut in half, cut out the seed area, and place skin-down into the food medium so the cut face of the apple is even with the surface of the bran. The skin keeps the bran from absorbing the moisture from the apple. The mealworms eat these moist items for hydration. Actual water is not necessary for mealworms. Cover: layer three sheets of brown paper (e.g. a paper grocery bag) cut to size for the bin. The paper enhances the darkness that the worms prefer, it helps insulate the growing worms during drops in the room temperature, and the worms and beetles like to crawl among these layers of paper – sometimes making it easier to find them to pick them out. Dust Mask: to wear when it becomes time to sift frass out of the bin; the dust mask minimizes inhalation of the frass. Outdoor sifting – in the shade – is best if the weather is warm and dry. Sifters: Not a baking flour-sifter. 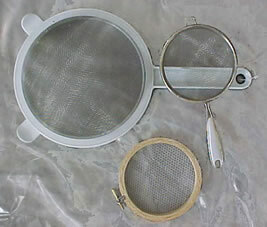 As worm growth progresses, two (2) kinds of sifting processes may be needed. 1) Sifting worms out of the bin for putting into the feeder; 2) sifting frass from the bin to allow space for refreshing the food medium. Most folks who raise mealworms have tried a wide variety of sifters/strainers – looking for the right one. Perhaps you will, too. Basically, one that holds 1-2 cups of the bin’s contents at a time, has a handle, and is made of fine mesh will work well for the job of sifting out frass. For separating worms, a medium-mesh nylon net placed in an embroidery hoop has been our best find … so far. This embroidery hoop/mesh set-up allows too-small of worms to fall through back into the bin while briefly holding on to the larger worms to dump into a container. In any event, no sifter will likely be needed for at least the first couple of months. Thoroughly cool the bran and then place a 3-4″ deep layer into the bin. If the apple dries out, leave it – beetles often lay their eggs right in the apple. If the apple becomes moldy or rotted and is wetting the bran, discard it and replace with fresh. However, keep in mind, the beetle eggs may have been discarded with that rotted apple. The white, oval-shaped, darkling beetle eggs are extremely tiny (2 mm long x .09 mm wide). A magnifying glass would be needed to see them. However, finding where they are in the first place could be a challenge in itself. The eventual presence of worms will most likely be detected only when the “hatchling” worms have begun to grow and start shedding their skins. Small piles of tiny shed skins can then be seen on the top of the bran. Generally, this stage will be reached about 4-8 weeks after beetles were first placed/appeared in the bin. Therefore, when the tiny worms begin to appear in a bin, one might want to consider starting a second bin and moving the beetles from the first bin to the second. At this point, there are likely still thousands of yet-unhatched eggs in the first bin. If the beetles continue to remain in the first bin, the eggs that they will continuously lay will eventually be sifted out with the frass and lost. As the growing worms eat the apple, replace it with fresh apple. The emptied apple skin may be discarded. Additional bran may also be needed. As space allows, more bran may just be added to the bin. Sometimes, frass may need to be sifted out to create space for added food medium. If there are eggs or tiny worms in the frass, they will pass through the sifter with the frass. Generally, the time from beetles to feeder-size worms is approximately 3-4 months. A rotation of 3 bins – started 1-2 months apart – usually provides an on-going resource of feeder-size worms. As the first bin is dying down and ready to be replaced, the second bin should have feeder-size worms ready, and the third bin is producing little worms. The first bin is ready for fresh bran and beetles. When the second bin is dying down, the third should start having feeder-size worms, and the first have little worms. And so on. However, until one learns the process and time involvement, of raising mealworms, one bin might be preferred – to supplement buying worms. While raising mealworms is easy, it really is time consuming in order to truly keep up with the bin rotation described above. Pupae – the plural form of pupa. When the mealworm turns into a pupa, the pupa is initially white. As the pupa ages and moves closer to the beetle emerging, it becomes a yellowish-brown color. Adult – darkling beetle When the beetle initially emerges from the pupa, it may be more reddish in color. The beetle will turn dark brown-black in a day or so. The beetle does not fly. In addition to baking the food medium, “friendly” spiders are excellent guards against moth infestations … except if one is uncomfortable with spiders. Spiders will make quick work of moths and take only a few mealworms themselves. While mites themselves will eventually kill the mealworms, moths spin webs in the bran making it unavailable for the mealworms. Indian meal moths will also fly to other grain products in the home such as cereals, pasta, bread crumbs, etc. These, however, are not clothing moths and do not eat fabric. Mealworm frass is an exquisite plant fertilizer – indoors and out. We do, however, recommend not having it on the top of the soil for indoor plants as watering it will enhance its odor. Otherwise, we’ve not met any kind of plant – leafing, flowering, or fruiting – that doesn’t love mealworm frass. Do-it-yourself suet mixes – there are numerous recipes available, but most consist of some combination of peanut butter, fat, oats and cornmeal. Our own Links page has a listing of several Suet recipes, and links to other sources of recipes, along with some information the use of various sources of fats. Not all Bluebirds will accept suet mixes, but with some patience and persistence, you may find that you can get them to understand that this is a good source of food. If your Bluebirds already accept mealworms from you, it may help to mix some of the suet mixture in with the mealworms. They may pick the mealworms out and leave the suet, but they are bound to get the taste of the suet mix, and once they realize that it tastes good, they may begin eating it eagerly. Sometimes it may take weeks, even months or years, to get your blues to accept the suet, but when they do it is worthwhile. Keep in mind that the adult birds teach the young ones what is good for food and what isn’t, so if you can get the parents to take the suet, likely the next generation will learn to accept it as well. Bluebird nuggets are a commercially produced substitute for homemade suet recipes. Some Bluebirds have learned to eat them, but again, it may take some time and patience. Crickets – some people have had a degree of success with feeding crickets. Of course, they may be a bit more difficult to keep in a dish, since they hop rather than crawl, like mealworms. Usually it is necessary to “disable” the crickets by removing one of their jumping legs, or by freezing them and serving them cold. Some Bluebirds will eat frozen or dead insects, but others will not, so it would be best to start with a small supply to see if this works for your particular birds. Crickets may be available at the same live food suppliers where you can purchase mealworms. Do I have to feed the Bluebirds if I put up a nestbox? It is not necessary to feed mealworms to your backyard Bluebirds. Bluebirders with trails would have neither the time nor the resources to feed trail box Bluebirds every day. For the backyard Bluebird landlord, feeding mealworms is a wonderful way to help your blues out, especially in bad weather, or during the winter months. During nesting, it’s also a help to the adults so that they don’t have to venture too far away from the nest (that they need to protect) to look for food. Another great reason to offer them — to bring them in closer for viewing!